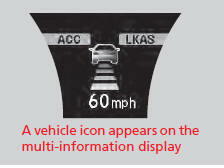 ACC with LSF monitors if a vehicle ahead of you enters the ACC with LSF range. 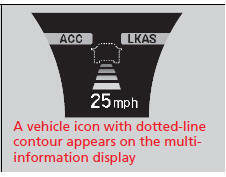 If it does, the ACC with LSF system maintains or decelerates your vehicle’s set speed in order to keep the vehicle’s set following distance from the vehicle ahead. When a vehicle whose speed is slower than your set speed comes in front of you, your vehicle starts to slow down. If the vehicle ahead of you slows down abruptly, or if another vehicle cuts in front of you, the beeper sounds and a message appears on the multiinformation display to alert you. 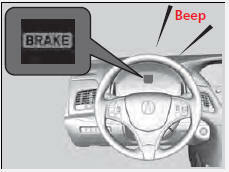 Depress the brake pedal, and keep an appropriate distance from the vehicle ahead. Even if the distance between your vehicle and the vehicle ahead is short, ACC with LSF may start accelerating your vehicle under the following circumstances: • The vehicle ahead of you is going at almost the same speed as, or faster than, your vehicle. • A vehicle that cuts in front of you is going faster than your vehicle, gradually increasing the distance between the vehicles. If you do not want to hear a beep when the system detects a vehicle, or when the vehicle goes out of the ACC with LSF range, you can change the pre-running detect car beep setting. When driving at 22 mph (35 km/h) or above: Your vehicle maintains the set speed without having to keep your foot on the brake or accelerator pedal. 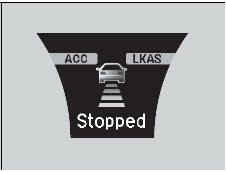 When driving under 22 mph (35 km/h) and no vehicle is detected ahead: ACC with LSF automatically cancels. The beeper sounds once. ACC with LSF stays on unless you cancel it. Once you release the accelerator pedal, the system resumes the set speed. Your vehicle also stops, automatically. The Stopped message appears on the multiinformation display. When the vehicle ahead of you starts again, the vehicle icon on the multi-information display blinks. If you press the RES/+/SET/– switch up or down, or depress the accelerator pedal, ACC with LSF operates again within the prior set speed. Use the brake pedal to maintain a safe distance with other vehicles in the following cases. ACC with LSF may not work properly when: • A vehicle ahead of you is parked when your vehicle is moving. • Motorcycles or other small vehicles are ahead of you. • A vehicle cuts in front of you at a short distance. • You make a sudden turn or drive on a narrow road. • You abruptly move the steering wheel. • You are in an unusual position within your lane.